Chris Coleman says Wales' success might be putting off major European nations from playing them in friendlies. Wales are unbeaten in Euro 2016 qualifying and top Group B, needing one point from their final two games to qualify for the finals in France. 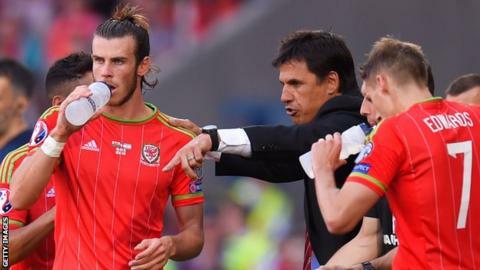 Coleman wants two high-quality November friendlies in what should be the start of Wales' build-up to their first major tournament in 58 years next summer. "We were turned down by one or two and Italy didn't want to play us," he said. "We thought that we might be able to tempt a Spain or a Germany and find out how good we are, but there's been no interest. "Look at the friendly games and the big boys keep it among themselves. That's disappointing. "We had Holland last summer and you want to play against those sides, those juggernauts. "But we're not seen as an England, Italy or Spain and we're in that spot where we are a danger to some of the big boys in that we could win. Maybe they are scared of us." While the established European powers appear reluctant there is the possibility later in the season of Argentina playing Wales, who have reached an all-time high position of eighth in the Fifa world rankings. "There's talk of Argentina after Christmas," Coleman said. "It's been on the cards for a long time and it would be great if we could tie that down. "Should we get to France then we need a couple of really good, juicy games before we get out there. "Once we know the [Euro 2016] draw we'll be right in the mix." Wales complete their Euro 2016 qualifying campaign away to Bosnia-Herzegovina on 10 October in Zenica and at home to Andorra the following Tuesday at Cardiff City Stadium.